Marine plastic pollution is a major concern for the global oceans since an estimated 8 million tons of plastic are released from land into the ocean each year (Jambeck et al., 2015). A recent study reported more than a 20-fold increase in marine litter in the Arctic over the course of a decade at the northern station of the Hausgarten Observatory, east of Svalbard (Tekman et al., 2017). Once deposited in the ocean, plastic can be dispersed by both wind and ocean currents. 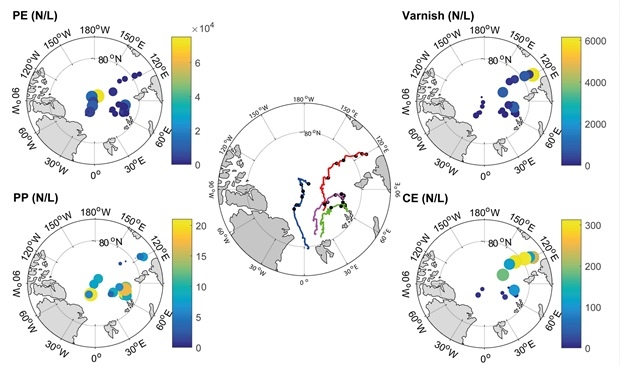 For example, a recent study showed that the poleward branch of thermohaline circulation transfers floating debris from the North Atlantic into the Eurasian Arctic (Cózar et al., 2017). Plastic items are a major threat to marine life that can become entangled or ingest debris (Bergmann et al., 2017). In the subarctic and Arctic, there was early recognition that seabirds collected at the main colonies along the Alaskan coast were ingesting plastic particles (Robards et al., 1995). In fact, some seabird species (e.g., northern fulmars (Fulmarus glacialis)), have been used as sentinels for plastic pollution in the Arctic because of these early observations. During the first Arctic circumpolar study of microplastics in 2013, quantities of marine debris at the sea surface were relatively low in comparison to the other ocean basins, and particularly in comparison to the subtropical ocean gyres where much of the ocean's plastic debris accumulates (Cózar et al., 2017). However, the survey indicated particularly abundant plastic debris in the Greenland and Barents seas and estimated that 95% of the plastic load in the Arctic Ocean is found in the northeastern Atlantic sector of the Arctic Ocean. The nature of the particle shapes and sizes pointed to a distant source region confirming long-term model simulations that suggest that these microplastics were transported via the Atlantic branch of the thermohaline circulation (Cózar et al., 2017). A recent study on global patterns of marine micro-particles demonstrated that concentrations were higher in the Arctic Basin than all other ocean basins in the world (Barrows et al., 2018). Once reaching the Arctic plastic particles can be incorporated into sea ice, which acts as a sink and transport vehicle of microplastics in the Arctic (Peeken et al., 2018). Despite public awareness of marine debris and specifically microplastics in the ocean and the growing number of studies and publications on the topic (Thompson, 2015), our knowledge of plastic pollution in the Arctic remains limited. Further, the lack of a global standard protocol for determining microplastic concentrations (Hidalgo-Ruz et al., 2012) often hampers quantitative comparison between studies. Thus, the overview presented here is based on average values from limited recent publications and sampling efforts in order to give first insight about the knowledge and understanding of marine microplastic pollution in the Arctic Ocean. Plastic debris in the ocean are broken down and degraded into small fragments by sunlight, fluctuating temperature, mechanical abrasion and wave action (Andrady, 2015). By definition, particles < 5 mm are called microplastics. Microplastics are a major concern because these micro-sized particles can easily be consumed by organisms that are food sources at lower levels of the food web, causing great accumulation in higher-level consumer organisms. This relationship has great potential health effects on both marine life and a range of trophic levels and humans, which consume contaminated food sources (Galloway, 2015; Lusher, 2015). Microplastics found globally (Kershaw and Rochman, 2016; Thompson, 2015; www.litterbase.org), have also been observed within Arctic sea ice in concentrations that are several orders of magnitude higher than the average concentrations found in global ocean waters (Obbard et al., 2014). Given the marked reduction in age, thickness, and extent of the sea ice cover in recent decades (Polyakov et al., 2012; Stroeve et al., 2012; see Sea Ice essay), it is likely that microplastics temporarily stored in sea ice will be increasingly released into the pelagic Arctic system. 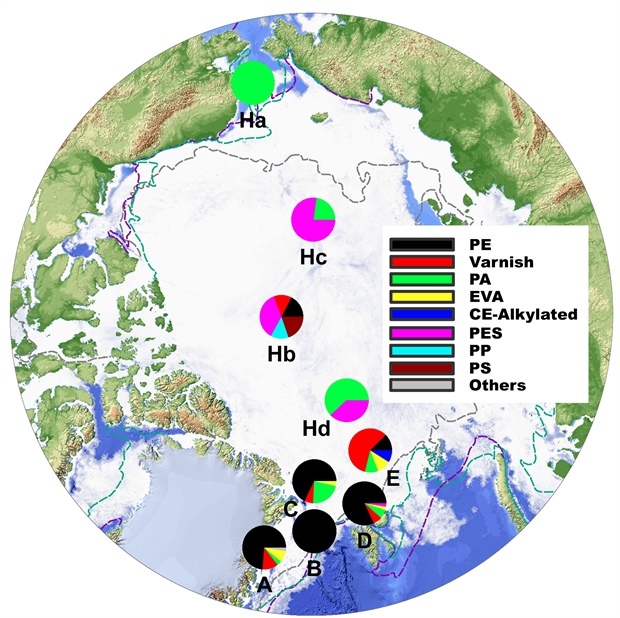 While studies of microplastics in the Arctic have increased over the past few years, considerable geographic regions, namely the Siberian and Amerasian Arctic, are greatly understudied (Fig. 1). Existing Arctic studies have reported microplastics in a range of different habitats including sea ice, the water column and deep-sea sediments (Table 1). A synthesis of current microplastic concentration data (Fig. 1) reveals relatively high contamination levels in the northeastern Atlantic Arctic sector and even in remote central regions of the Arctic. The highest Arctic sea-surface concentrations of microplastics (average 33 N/L) were reported in the Arctic with particular high concentrations in the Beaufort Sea (Barrows et al., 2018). There appears to be an increasing trend in concentrations over the last approximately 10 years in certain regions of the Arctic where repeated studies were carried out. For example, microplastic concentrations in the Greenland Sea have doubled between 2004 and 2015 (Amélineau et al., 2016). Table 1. Average concentrations of microplastic particles in various marine habitats of the Arctic Ocean. Compared to the water column, sea ice and deep-sea sediments have microplastic concentrations that are several orders of magnitude higher (Table 1). It is well known that particles such as sediments become concentrated in sea ice during ice formation (Nurnberg et al., 1994), but the phenomenon for microplastic incorporation and concentration into sea ice remains to be investigated. 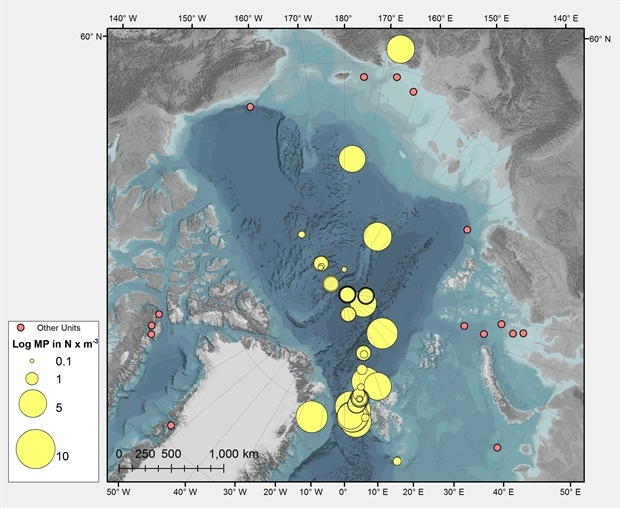 A study found that microplastic concentrations in deep-sea sediments in the Fram Strait were considerably higher than sediments collected elsewhere within the Arctic (Woodall et al., 2014). The high volumes of sea ice transported from the Arctic Ocean via the Fram Strait are a potential source for these relatively high sediment microplastic accumulations and imply that the sea floor might be the final destination of anthropogenic pollution. Microplastic concentrations in Arctic seabirds have been relatively well-studied since the 1980s (Table 2). Early studies of northern fulmars documented ingestion of plastic as early as the 1980. The increasing trend of microplastic particles observed in sea water has interestingly not been evident in Arctic seabirds. For instance, the repeated study between 2004 and 2015 in the Greenland Sea found no difference in the amount of plastic found in the pouches of little auks (Alle alle) despite a doubling of microplastic concentrations measured in seawater (Amélineau et al., 2016). Regional variations in seabird ingestion of microplastics are clear, with much higher contamination levels observed in the Eurasian Arctic relative to the Canadian Arctic. Limited recent studies indicate that microplastics have found their way into other elements of the Arctic food web, including polar cod (Boreogadus saida) around Svalbard and the Central Arctic (Kühn et al., 2018) and bigeye sculpin (Triglops nybelini) around Svalbard (Morgana et al., 2018). A recent report revealed microplastics in 11 species of benthic invertebrates, with concentrations between 0.04 and 1.67 N per individual (Table 2; Fang et al., 2018), which are at the lower end of contamination found for this organisms in the world. Plastic has also been found to have even been consumed by Greenland shark (Somniosus microcephalus) off Svalbard and Greenland (Leclerc et al., 2012; Nielsen et al., 2014). Table 2. Examples of plastic ingestions of small particles, mainly MP, by marine birds, fish, and megafauna from the Arctic. The identification of the various polymer types of microplastic allow the opportunity to draw some conclusion about the main sources of the marine litter which have been disposed (Kershaw, 2015). For example, cellulose acetate is primarily used in the manufacture of cigarette filters and reflects their deposition footprint even in several samples of the Arctic (Table 3). A recent study of sea ice cores revealed strong differences in the polymer composition between sea ice cores (Fig. 2 and Table 3; Peeken et al., 2018) as well as within individual horizons studied from a single core (e.g., Fig. 5, in Peeken et al., 2018). Particular ice floes, that are driven in the Pacific water masses of the Canadian Basin or connected to the Atlantic inflow (Fig. 3) contained high concentrations of polyethylene and polypropylene particles, which are above all used in packaging material and bottle caps and suggest a long-range transport in this region. In contrast, paint particles from ship's paint (varnish, CE-Alkylated, Fig. 3) were mainly found in ice from the shallow marginal seas of Siberia. Overall shipping activities have increased between 2009 and 2014 in the Arctic (Ellis and Brigham, 2009; Miller and Ruiz, 2014) and fisheries account for a major share of the increasing ship traffic in the Arctic Ocean (Eguíluz et al., 2016; Ellis and Brigham, 2009). Polyamide, also called nylon, is a typical polymer associated with the waste of fishing gear, which was present in most studies conducted in the Arctic (Table 3). These findings suggest that both the expanding shipping and fishing activities in the Arctic also point to local pollution in the Arctic. Since large fractions of the sea ice are melting at the outflow gateways of the Fram Strait and the Canadian Arctic Archipelago, sea ice can only be a temporally sink for microplastic. Given the ongoing decline in sea ice (Arctic Report Card 2017, Sea Ice Essay), the release of microplastic might accelerate in the future. Whether these potentially released marine plastic particles are sedentary or remain and accumulate in Arctic waters or are transported to lower latitudes still needs to be studied. Table 3. Most common identified composition of MP particles (average) in various marine habitats of the Arctic Ocean. To evaluate how much these common polymer types contribute to all studied polymers in each study, the % of identified plastic particles is listed in the second column. Polyethylene (PE), polyester (PES), polyethylene terephthalate (PET), polyamide (PA), polypropylene (PP), polyvinyl chloride (PVC), polystyrene (PS), cellulose acetate (CA). Data were extracted from the various publications, taken from text, tables, or figures. Plastic pollution is present throughout the various Arctic realms from the water column to deep sea fauna. In the Arctic, it is clear that sea ice is a particular transport vector, but currently very little is known about the effect of microplastic on the sympagic (or sea ice dwelling) biota, which are an important food source for the Arctic ecosystem. Future studies are needed to evaluate which negative influence these pollutants have on the performance of this currently productive ecosystem.